In the medical device industry, there is a critical need for miniature and micro-miniature connectors. As devices grow more compact while transmitting increased amounts of data, the selection of a reliable connector that handles high bandwidth data and maintains performance in challenging conditions is vital. Connectors for medical devices must be extremely easy to use; medical personnel must be able to quickly connect or disconnect devices in life-or-death situations when every split second must count. To facilitate ease of use, the connectors should offer visual, mechanical, tactical, or audio mating. Additionally, cable assemblies used with the connectors should be over-molded and textured to ensure secure handling even during distracting, high-stress situations. These electronic connectors must remain fully secure during use, which can be challenging in an active environment like hospitals, medical offices, and more. Whether the design is for a portable device or an implantable device, small, lightweight, and highly dependable electronic connectors are needed. These devices will be exposed to a variety of chemicals, fluids, and other matter. They will experience impact and vibration on a regular basis, and they are most likely going to be subjected to frequent mating cycles. Connectors that can handle an aggressive environment like this must be rugged, durable, and hermetically sealed. The applications for medical device connectors involve the transfer of millions of bits of information every second and this makes high-bandwidth capabilities a must. Many times, these devices are a part of the Internet of Things (IoT) and transmit data-rich information between devices, cameras, imaging equipment, and computers. Protecting signal integrity is of vital importance, and so is shielding, EMI resistance, and RF compatibility. When it comes to specifying connectors for medical applications, they must meet ISO and EIC standards while also complying with patient safety requirements. Some connectors might even need to be disposable. Connectors may be exposed to a wide range of temperatures (e.g., sterilization, human body temperature, cryogenics) and must keep the same level of reliable performance. As mentioned previously, they must also be lightweight and compact in size depending on the application. One of the most popular solutions for the constraints and specifications of the medical industry is LEMO S series electronic connectors. They are available in multiple sizes, 9 color codings, and 50 different shell styles. LEMO S series connectors have an operating temperature range of -55°C to 250°C. There are numerous options for shell, shell plating, contacts, and insulator materials. The o-rings and gaskets are made from durable silicone. Furthermore, these connectors are available as unipole (rated up to 230 A), multipole (up to 106 contacts and stepped inserts for aligning), triax, coax, thermocouple, high voltage, and even mixed contacts. There are so many applications for these connectors within the medical industry. When it comes to analyzers and processing equipment, they have proven extremely reliable for gathering data. Depending on the application need, they are also available sealed for wet applications. Stainless steel is an option for situations where hot sterilization is involved and longevity is key. LEMO S series connectors are excellent for disposable devices and one-time use situations. These high-quality connectors are extremely reliable in sensitive environments and available in polymer materials familiar to the medical industry. 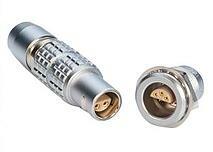 These connectors have found many applications in electrosurgical devices where RFI/EMI shield performance is critical. This reliable performance is made possible in part through the use of mixed-signal inserts. Another example of LEMO S series connector applications would be their use in pacemakers and hearing devices. Connectors for these devices must be small, lightweight, and reliable with connectors for external modules or battery packs. As medical devices become more portable, the connectors for these devices must become smaller and more lightweight while staying reliable in extremely challenging conditions. Environmental constraints, connector performance, high-bandwidth capable, effective shielding, and compliance with industry standards are critical considerations when designing medical devices. Fortunately, the LEMO S series connectors has proven itself capable of performing well within these constraints. Whether the medical device you are designing interfaces with an MRI machine or is intended for application within the human body, PEI-Genesis will find reliable, compliant electronic connectors for you. We are your source when it comes to electronic connector and cable solutions for the medical industry. Our skilled team will assist you in finding the connectors you need, whether it is COTS or a custom-engineered solution. Contact us today and take advantage of our years of industry-specific knowledge and experience!